Does my home need rain gutters? Every time it rains or snow melts, water drips off your roof. Your front or back steps become iced, slippery, and hazardous especially in wintertime. Gutters will prevent the drowning of flowerbeds and shrubbery and reduce splashing of dirt onto your foundation. Lack of gutters can destroy your deck, windows, siding, woodwork, as well as stonework and concrete. Don’t underestimate the eroding power of water! Gutters will prevent water from gathering around your foundation which will result in dampness and cellar damage. It will also help leaky foundations. Because your old gutters are an eyesore and can detract from the beauty of your home. Gutters will help reduce the hazards of ice damage to trees and bushes around your home. Gutters will help protect against pest infestation by keeping the perimeter of your home dry. Properly installed gutters can prevent your fascia board and corner boards from premature rot. Gutters will increase the value of your home. Gutters can prevent erosion of your backyard. 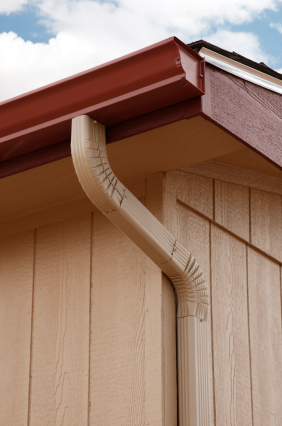 Our superior gutters with leaf relief are guaranteed never to clog or pull away from your home and come in a variety of colors to compliment your home’s exterior. Made of .032 heavy gauge seamless aluminum, our gutter systems have superior strength over seamed aluminum plastic “do it yourself” gutter systems. Are you insured & registered? Yes, we carry full Workman’s Compensation & Liability insurance policies. We guarantee all aspects of our workmanship for 7 years and materials for 25 years. What is the primary job of a ‘Leaf Guard System’? The primary job of a Leaf Guard System is to keep debris out of your gutters and keep the water free flowing. There are a variety of names, some brand specific such as Gutter Guard™ and Gutter Helmet™ that are used when talking about these products. However, don’t be misled by names or marketing slogans. Alcoa’s Leaf Relief™ product gives you durable solid aluminum construction and fits most existing gutters and gutter systems. Installation of your home’s leaf protection system is quick and the benefits are immediate. What is the difference between seamless gutters and what I can buy at Home Depot? Seamless gutters are custom fitted, one-piece gutters manufactured at your home. They are far superior to sectional plastic or aluminum gutters bought at home improvement stores. Seamless gutters do not have in-line seams, which always fail. Seamless gutters are made of aluminum or copper that will last for years. Our material is also made of .032 inch aluminum, which is far thicker than anything that these stores sell. Do seamless gutters cause ice dams? No, seamless gutters do not cause ice dams. Ice dams are caused by heat loss & weather patterns. Many homes without gutters encounter ice dam problems worse than homes with gutters. See our section on Ice Dams for further information. Do seamless gutters help with wet basements? Yes. They direct all the rainwater from the roof away from your foundation reducing the amount of water that may collect around & leak into the foundation. 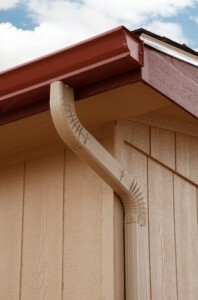 Gutters are supported by two key components: the screw & the hanger. This combination makes up the most important component that insures the longevity of your gutter system. Because they’re a blind item to the buyer, most overlook its importance. A vast majority of gutter companies use inferior hangers and screws. Even more appalling is the amount of companies who use drywall screws, or deck screws to secure their gutters. Superior Gutters uses Hangfast hangers. This combination is the secret to our warranty. Ask to see a comparison – customers can compare and see the difference for themselves. The only maintenance required is cleaning. Rain gutters should be properly cleaned & flushed regularly (twice per year for the majority of homes). This cleaning maintenance allows rain gutters to flow properly without obstruction. How long will the project take, and do I have to be there? Most homes only take a few hours on average, and it is the customer’s choice if they can be there or not. Will gutters detract from the appearance of my home? Gutters and downspouts are important investments for your property: They protect your residence or business from weather damage and decay. Just because gutters perform an important function, however, doesn’t mean they need to be unattractive. Superior Gutters, LLC. offers top-grade material in a variety of colors for seamless gutters that will not only protect your home or business, but add to its beauty as well. Many factors are taken into consideration when choosing the best solution for our customers. We consider the roof pitch, design and surface area, longest gutter lengths, and aesthetics. We work very closely with homeowners during the consultation phase to come up with the most effective, aesthetically pleasing solution for their house.